Free Shipping Included! Finnhomy Professional Portable Photo Studio Photo Light Studio Photo Tent Light box Table Top Photography Shooting Tent Box Lighting Kit, 16'' x 16'' Cube by Finnhomy at Marco Marcucci. MPN: F09WVPST1253. Hurry! Limited time offer. Offer valid only while supplies last. 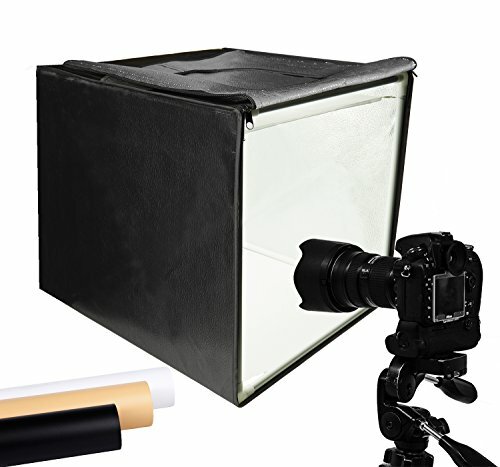 16'' Cube Portable Photo Studio, designed for effortless product photography. You can easily take pictures of your item with pure color backdrops. 16'' Cube Portable Photo Studio, designed for effortless product photography. You can easily take pictures of your item with pure color backdrops. The 5500K daylight white LED bands provide perfect lighting, you can adjust the bands on the steel strips or just place them on the frame bar, the magnets on the back will stick right on! Ideal for Product Photography: You can adjust the positions of 5500K LED bars on the two metal strips of the top, or even place the bars on the frame. Meet all your needs!Soft, bright lighting and pure background (3 color options) is perfect for taking pics for your blogs and personal sites. 3 Way Openings(Front and top) for different shooting angles. Note: If you put the light softener on, you may not take pics from top opening, cutting a hole on the softener will enable imaging from above. Premium tent body with wrapping design prevents it from wearing during the process of installation and using. Perfect shading effect provide wonderful photography experience. Unlike simple portable photo studio, it will not influenced by other rays when taking photos. For preventing the background slip out, please put the corners of the background under the tube while using it. Easy to put up and uninstall, no tools required. Come with carry bag for easy transportation, can be used in different places with phones or cameras.